Given the near week of rain we’d had and our inability to get out to the bush, we were watching the weather details on the tv with a touch more than avid interest. In the end, Thursday looked like the go. Frost on the ground, little fog in the morning and sunny day. Sounds just about right. Plug into the universe that Mr An Onymous lives in, and we are right to go. As we drove down the Geelong Freeway toward the Point Wilson Road turnoff, it did look a bit nigglingly worrying that we could hardly see the car in front, and the verges of the road occasionally seemed to disappear completely in the fog. Oh yeah, fog. Not your “Oh, it’ll burn off after breakfast, fog.” Nor your “It’ll be gone by morning tea fog”, but your, this is pea soup, English fog, and you can expect to drive over London Bridge at any moment fog. Exposure times were looking like f/4 at a fortnight. And of course once we got into the WTP, (they’ve put up a new gate and entry on Paradise Road. Very nice. Your water rates at work. 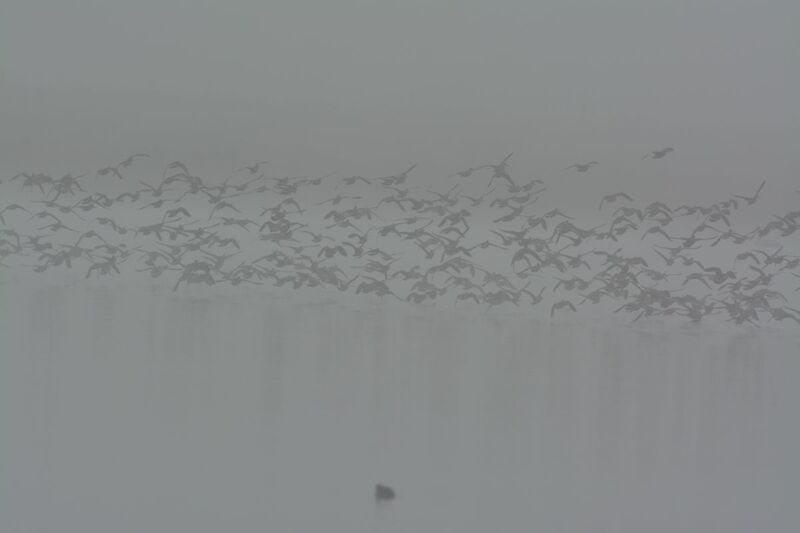 ), it became obvious that right after heavy rain in strong wind, fog will just about wipe out all hope of seeing birds. After all, if you’re just barely able to see the road to keep the car on it, oh, whats that- a GATE, stop car quickly- then its going to be harder to see a Whistling Kite slipping across a paddock. Speaking of paddocks, where were they? 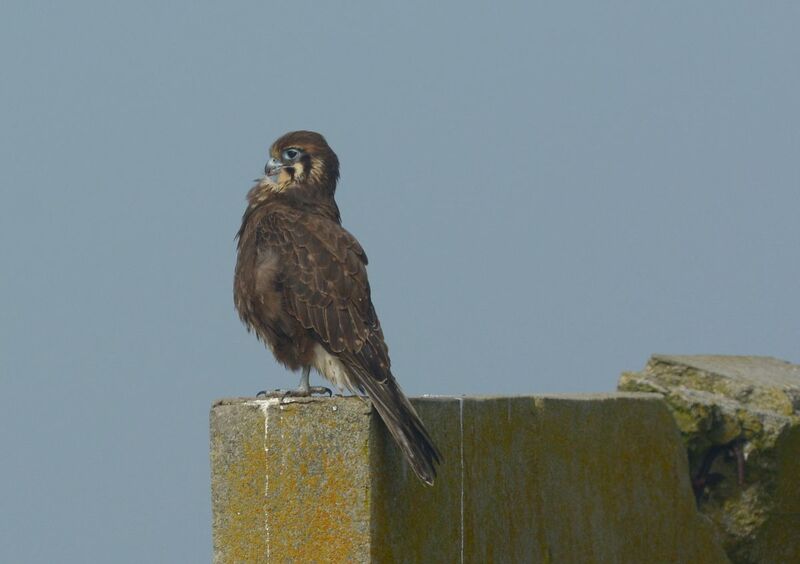 Then we found a Nankeen Kestrel, sitting on a post on the side of the road. I think we snuck up on it as it couldn’t see the grey car in the grey fog. 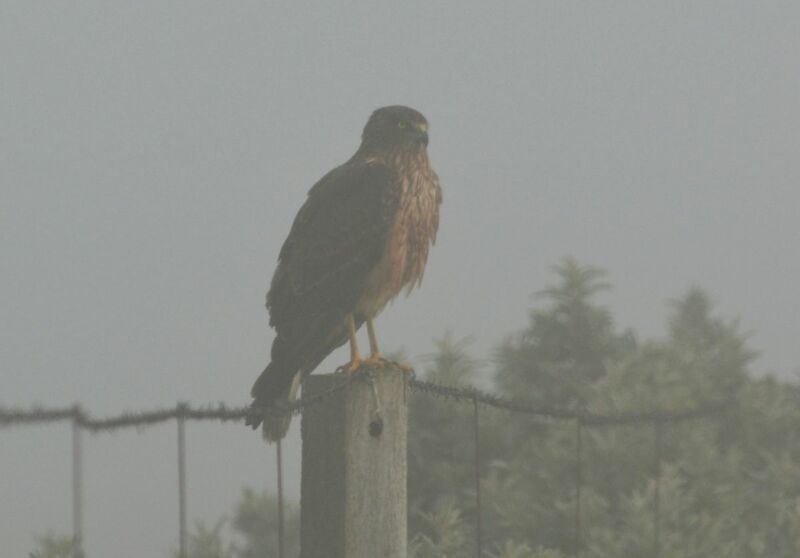 But then suitably surprised, it thew and promptly disappeared in the fog. Hmmmm. Let’s go and photograph some trees in the mist. That seems like a good idea, there are some nice looking old skeletons up near The Borrow Pit, and let’s face it, any respectable Orange-bellied Parrot is not going to be out and about today, so we went. And. As we got further into the plant, with more paddocks, and more water in the ponds, of course, the fog got, well, thicker. How could you tell? So breakfast fog came and went, so did morning tea fog, and lunchtime fog was giving us a good run for our money, and then the first hint of a bit of blue sky and things became a little ‘clearer’. Pink-eared Ducks airborne in the fog. Now they had seen a Swamp Harrier come over the water, and were gone. Oh, that was what that dark shape was. Pink-eared Ducks getting radar guidance to avoid Swamp Harrier. This is the closest I’ve ever been to a sitting Swamp Harrier. Now I know what they look like in the fog. 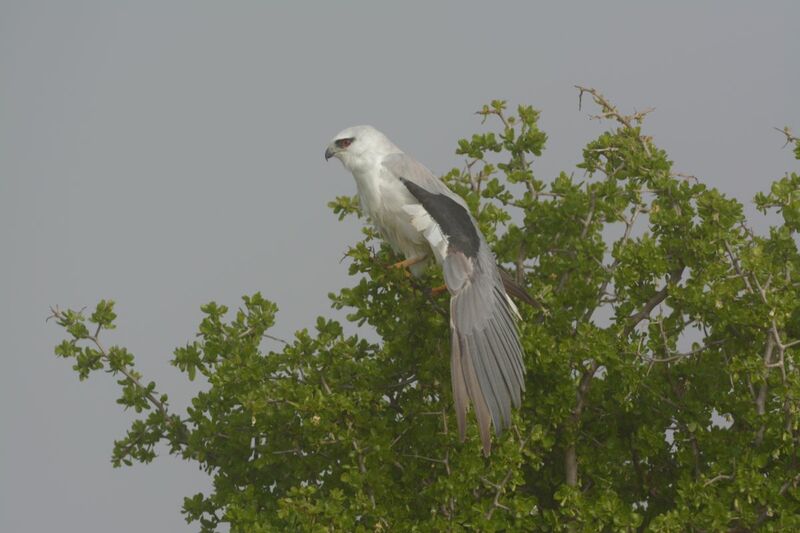 Down near the beach with a bit of a break in the cloud and some sunlight came out and the Black-shouldered Kite responded with a wing stretch. Brown Falcon down on “Brown Falcon Bunker” at the turn on Twenty Nine Mile road. Most WTP visitors will know this bird. here it’s having a bit of a preen in the sunshine. 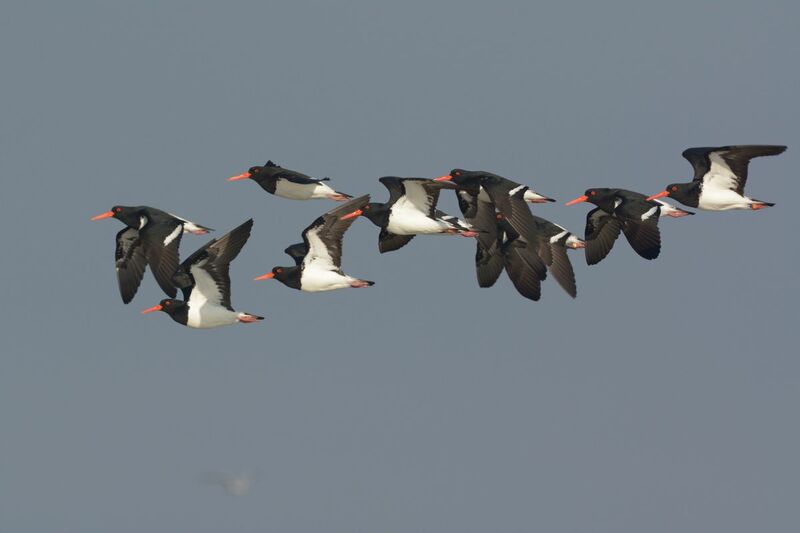 I’ve only ever seen the odd one or two Pied Oystercatchers. 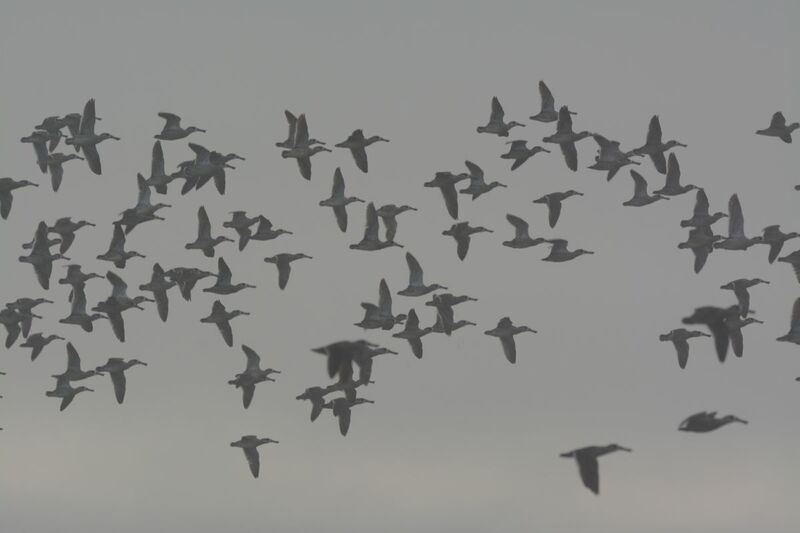 Nice surprise to see a veritable flock. 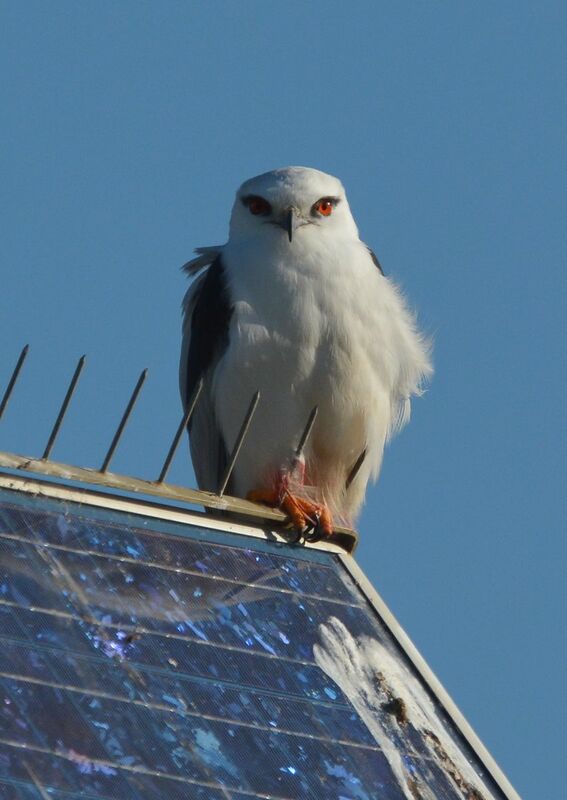 Black-shouldered Kite, sitting on a solar panel with the sharp metal spikes to keep birds from perching on there. Yep, they work well don’t they. Its showing a good deal of warpaint from its last meal.